Customizing gifts is fun. It adds a little something extra to the item that suggests that you put in a little more thought and effort into creating the gift – whether it’s creating the design, taking the photograph, or writing a thoughtful note. And when it comes to custom products, custom t-shirts are so much fun to make and to give to grandparents, kids, or friends. Fibers.com is a great site that allows you to quickly and easily create your very own custom t-shirts. 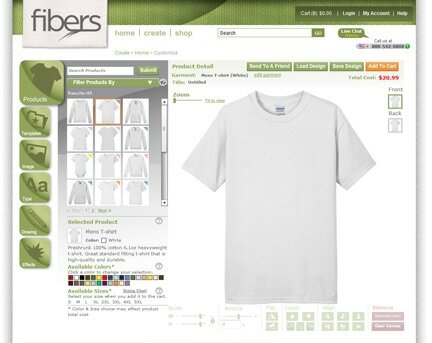 Fibers.com is an innovative website that gives site users the opportunity to design and order customized products, such as t-shirts, hoodies, and a variety of other clothing items. With our revolutionary technology, each and every design on the site is customizable, allowing you the freedom to go with your creative vision. From editing text and changing the image design and colors to resizing images and switching around elements, you can create a truly unique look for your desired product. I sat down at my computer, ready to design my own custom t-shirt. Fibers.com already has several pre-made designs that are cute, fun (and customizable) including I Heart t-shirts and family t-shirts. I opted to design my own from scratch, which is something that you can easily do on Fibers.com in 3 steps. Don’t be fooled by the term Custom T-Shirts. Fibers.com offers so much more than just a standard t-shirt, from hoodies to onesies to tank tops for men, women, and children. First select the product the you want, then you can narrow it down to the size and color that you’re looking for. 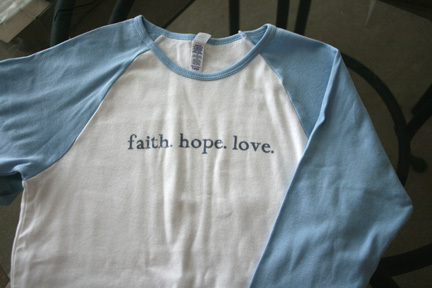 I chose the Women’s 3/4 raglan sleeve t-shirt in white and baby blue. After selecting your shirt, the real fun begins with Step 2: Design your product. 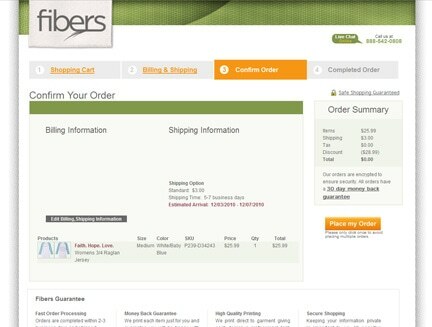 The Fibers.com online design tool is very easy and intuitive to use. They have premade templates and 380 pre-loaded images that you can use as a starting point. 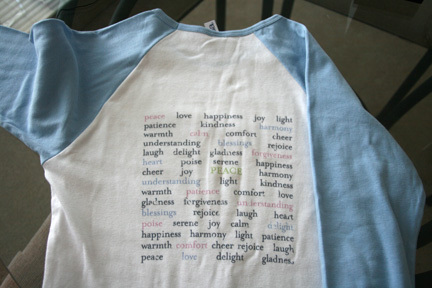 You can also easily upload your own design or write your own text on both the front and the back of the t-shirt. I had a lot of fun looking at the plethora of font types and type effects you could use (arcs, adjusting opacity, colors, etc.) You can also do cool textured or worn effects to your entire design. Here’s a shot of the back of the shirt I designed. Once your design is finalized, simply confirm your order (their confirmation screen will give you thumbnail shots of the front and back) and you’re ready to go! I was really impressed when I got an email from Jessica, one of their customer service reps, who wanted to make sure that I had reviewed the size chart for the shirt (I hadn’t) since the brand I ordered runs a little small. That’s attention to detail that not every company would take, so I really appreciated Jessica’s note. A couple of emails to change my size and the order was done. The order was placed on 11/23; I received notice of shipment on 11/26 and the shirt was at my door on December 1. Pretty fast turn around if you ask me. Here are a couple shots of the final product, which brings me to Step 3: Buy it and Wear it! I was pleased to see that it was a nice, durable t-shirt (not one of those cheap-o see through ones) and the print job was perfect! I’m thoroughly impressed with Fibers.com. They make the custom t-shirt design process very easy and user friendly and deliver a quality product in a very timely fashion. One winner will receive a $30 voucher to design their own Fibers.com custom t-shirt! Fibers.com allows you to create your own “I Heart ________” t-shirts. If you were to create one, what would you “heart”? Leave your answer in the comments below. Giveaway ends at 11:59 PM EST, January 6, 2010.
following you via google reader. Mine would be I <3 Adopting Dogs. i would “heart” my husband! “Like” The WiC Project on Facebook – Geri N.
I would love to create a shirt that said I Heart My Family! 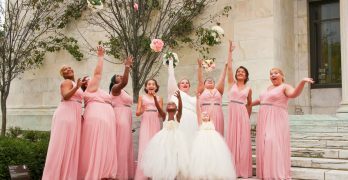 I’m following Fibers on Twitter @lisalmg. 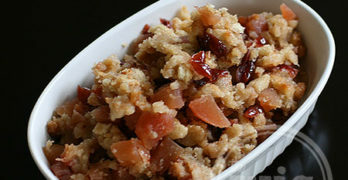 I like The WIC Project on Facebook user Lisa Garner. I would do I HEART Boogers! Which is one of the nicknames of my kids! Quick question, I am researching several websites that print custom t-shirts etc and have found that the printing quality was not great at places like Vitsa. Can you tell me about how the image has held up after several washes?